Norpac has many years of experience working on high angle slopes and we consider ourselves one of the industry leaders in knowledge and safety concerning this type of work. 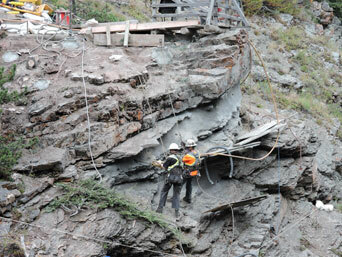 Rock scaling is basically the act of accessing an unstable slope in top to bottom fashion and removing slope hazards during the descent. This is normally done manually with highly trained scalers using specialized equipment for the task. Our crews are extremely competent and can execute almost any type of trade work in high angle scenarios. We can practically do any work at heights that you require done.